That woke you up didn't it? 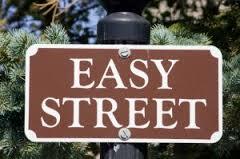 No.........this is the life I have always wanted! Recently, there have been many additions to the INDOOR flock! I had room for this little girl to roost at my place? I can't wait to get it quilted! Wendy also sent the 2 little chicken figurines in the foreground. This is on my kitchen window sill. The friendship star is from Priscilla in Connecticut! 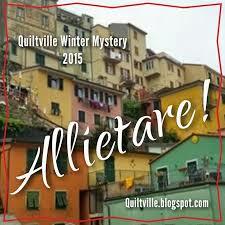 Thank you so much quilters! flying 6 long days in a row! The chicken goodies just keep on rolling in! This is from my good friend Patty Cakes......I mean Pat! should come live with me! Thanks so much Pat! You know I love it! My friend Ruth was at it again! 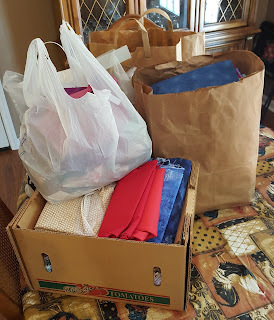 She received a bunch of scraps from various sewing friends of hers. She contacted me asking if I needed some more scraps? Why YES, yes, I do! 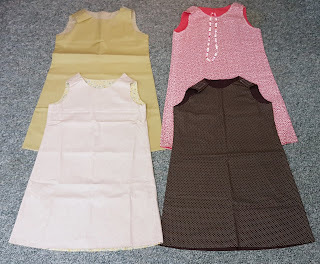 Are these pretty little reversible dresses scraps??? I found them in the boxes of scraps! 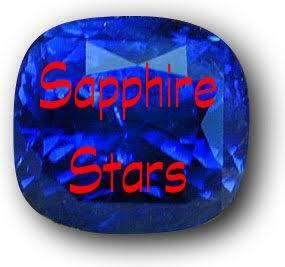 Hmmm......I wonder who could use these???? and that she herself had kept some wondering what to do with them? Ruth's dresses found their way to Lori as well! 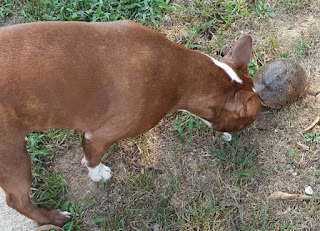 Lilly Mae met a new friend on one of our walks! it perfectly depicts her curious little nature! 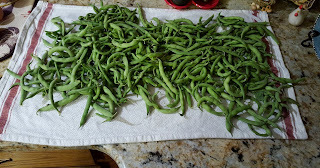 Who doesn't love some fresh green beans from the garden? and a whole smoked kielbasa sliced. at least my tummy is! Nebraska who I got to visit on my way to Colorado. a scrap bag from my good friend Beth. 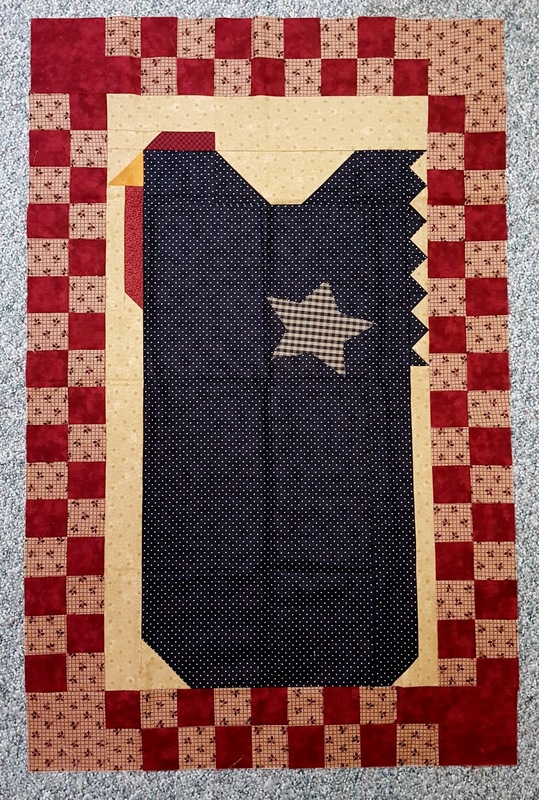 It was already pieced....all I had to do was quilt and bind it! I tried to mimic the waves on the water with the quilting. 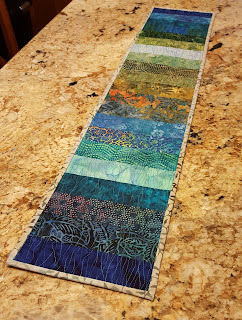 Another quilter's trash, is another quilter's treasure! Do you enjoy turning quilting trash into treasure??? It has been so fun to get to know her even better! 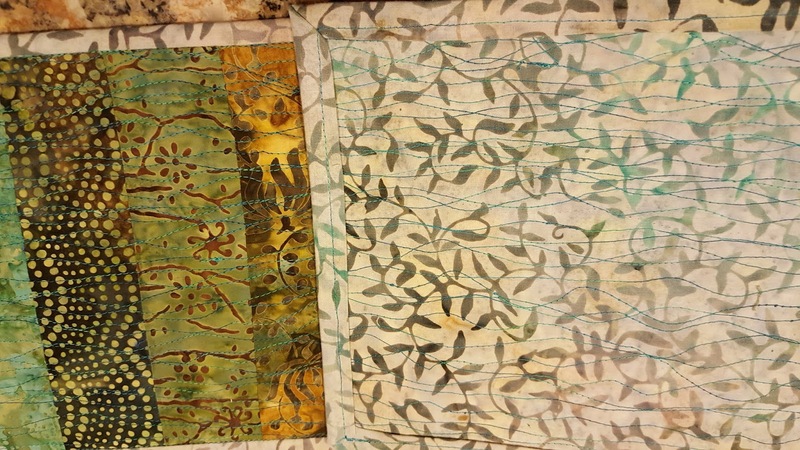 informative about the history and making of scrap quilts. Her trunk show was beyond amazing! Scrap Club hosted by Kevin the Quilter. 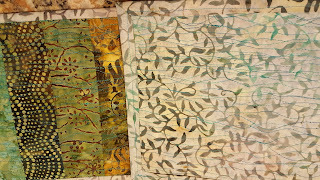 Do I love quilting, and the quilting community? 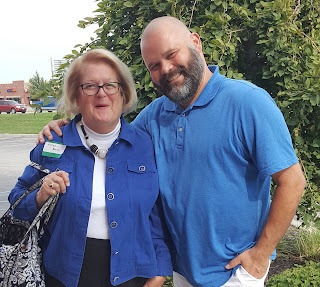 Thanks to my blogging friends for helping me with my blogging problems! What fun to read this post, Kevin, and see the fun things you've received! So glad you like little black hen from Minnesota! I know you'll give her a good home. 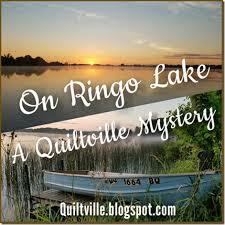 II'm going to quit picking out all my mistakes in that quilt top now - hahaha!) Enjoy! I'm going to try that green bean crockpot recipe - yum! I guess you are now collecting chickens and Boston Terriers now!! How fun! 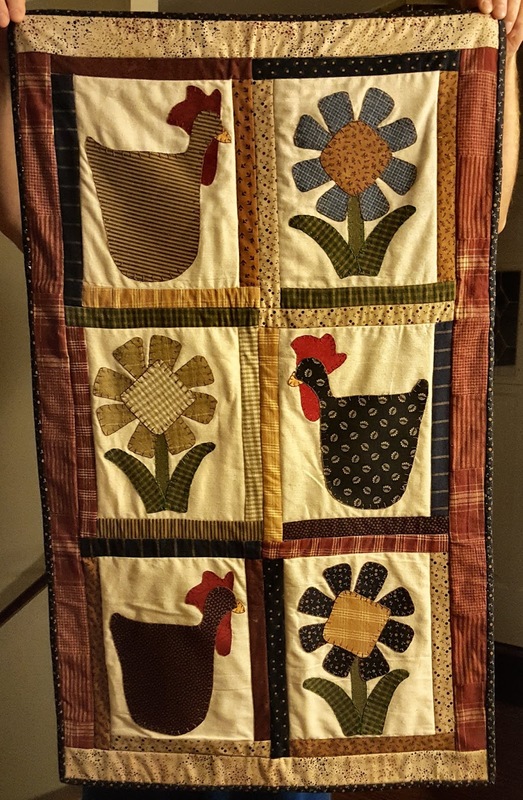 I'm so glad you were able to find a home where you can have your chickens and your fur babies, as well as room for your quilting! 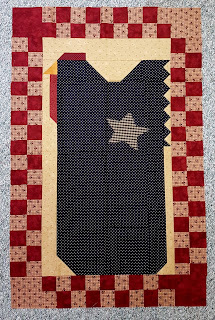 Amazing flag blocks...ya gotta love the love from the quilting community!! Enjoy some time at home now and enjoy the fruits (er, vegetables) of your labor! Happy to hear those dresses went to Lori. She'll find great homes for them to go to and it gives her such joy. Do I love your blog? Why yes .... yes, I do! Lol! Quilters are just such generous folks! You got some great loot :) My mailbox was full of unexpected fabric goodies this week, too! What fun, more chickens to love! Quilters are a special breed. Lilly Mae is adorable with the turtle. What sweet dresses! Lori is so special to make these trips. God bless her! 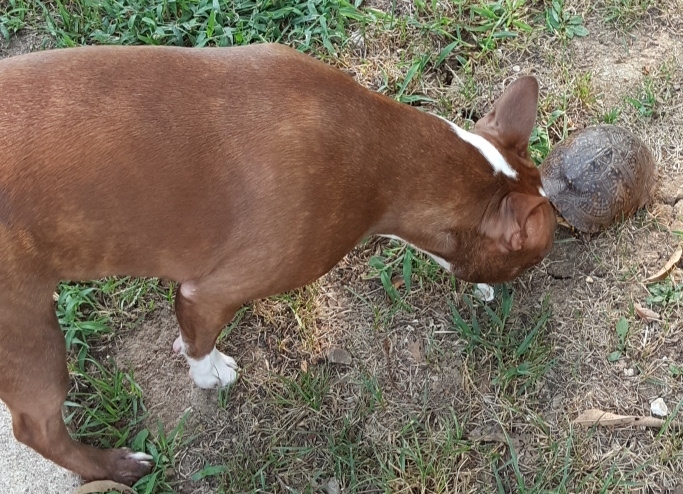 The turtle doesn't seem quite as curious as Lilly Mae! Too cute. Happy scrappy day to you! You have such a rich life! !and I am so amazed at the flags - what a great show of love for Sue - and I just a little choked up ( you know cuz I don't want to admit to a computer that I am crying) Thank you for including her in your missions!! Another great post - did I enjoy it? Why, yes. Yes, I did! I love reading your blog Kevin but I am so afraid of chickens!!! I don’t know why! Nothing bad ever happened with a chicken but for some reason they scare me! 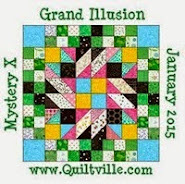 Quilters are the most generous people on the planet!!!! Great blog post Kevin. 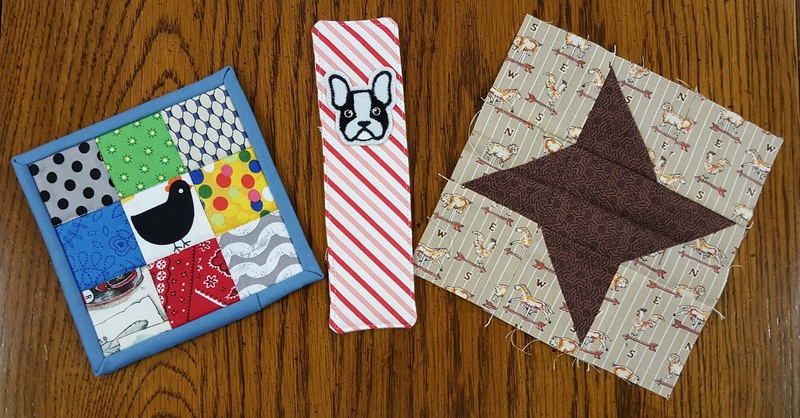 Those goodies you received are perfect for your Quilt Cave too! What a great view of the flags from your perspective (facing them in the front). They look amazing. Can't wait to see what Sue's husband thinks when he gets stacks and stacks of these in honor of his wife. Brings goosebumps to my arms. I'm trying to figure out why my roosters always crow at 3:30 am. Why aren't they asleep? Why am I not asleep? LOL Chickens are the best. What a fabulous post today! Love all the chickens, scraps and the group's flags are awesome. Gee, you might have to go away for 6 days in a row, again! What a haul! Looking forward to seeing those blocks on Alycia's blog. Love that chicken block! Great post and congratulations on the goodies! You have been blessed with all the gifted items. Must have been nice to come home to these surprises after 6 days in flight. 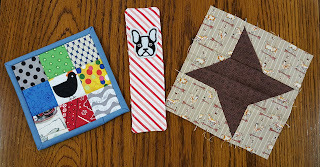 Quilters have generous hearts - flag blocks are awesome! Fabulous flags! 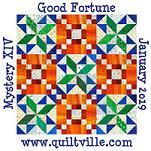 Quilters are just the most generous and kind hearted people on the planet! Wow! Quilters are so generous! It's always fun to be on the receiving end of fun stuff! I love the dresses!! Kevin, I love reading your blog updates and reading about all of your fun over there with your friends and chickens and pup. Lots of fun things going on at your place. Flying for 6 days in a row has to be exhausting, hopefully, none of those days were bad weather days. Hope you have time for some fun play time in the quilt cave this week.